You can control the angle of view of the camera from NVR or a computer or smartphone or tablet. Once the camera is mounted and set it in the direction you’d like it to look at, you can control the zoom at the touch of a button without having to climb up to the camera and change the lens settings. At the widest setting of 2.8mm, you can expect to have a 115 degree view. 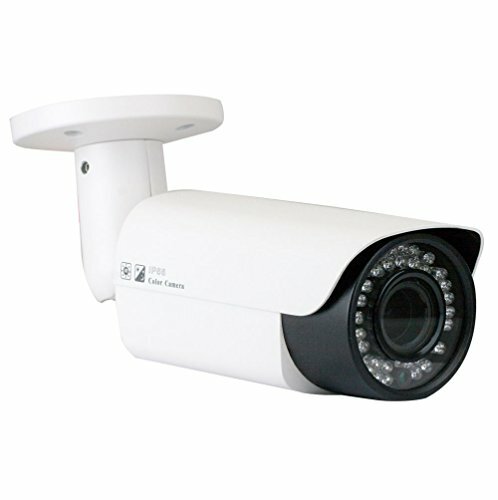 When you are zoomed in all the way at the 12mm zoom length, you will get a 22 degree view and be able to view up to 130ft IR distance. This GW Security IP camera employs advanced high resolution 1920P in combination to the latest 5.0 Megapixel CMOS image sensor which provides the best quality image day and night, resolution up to 2592 x 1920. This camera can record real-time 1536p and 1080p resolution at 30 frames per second, so that recorded video plays back smoothly and clearly. Alternately, even higher definition 5MP provides more viewing pixels recorded at near-real-time of 15 frames per second, for amazing detail and superior recognition of faces or license plates. This POE camera is completely Power over Ethernet so setup is clean and simple with just a single cable. Designed for easy installation, waterproof and vandal proof housing fits in most indoor and outdoor installations.